Today, for our Jewish Christmas, my husband and I decided to try out another recipe from the Marcus Samuelsson book, New American Table. We enjoy making crabcakes, and in the past we have made and enjoyed Goan Spice Crabcakes. Tonight’s recipe, which I made for lunch (we will be having leftovers again for dinner) is on pages 40-41 of Marcus Samuelsson's cookbook, and involves making three dishes: the crabcakes, a side of spiced corn, and a pistachio aioli. Coat in the mixture of panko and cornstarch. I had actually never made my other crabcake recipes with panko breadcrumbs in the past. I should have known better as the recipes always called for panko and not ordinary breadcrumbs. They always tasted great so I didn't pay attention to this. However, I used panko for the first time tonight and I can't believe I didn't realize this before. Panko breadcrumbs are much lighter and taste and look completely different from regular breadcrumbs. The end result is a lighter, crisper crabcake thanks to the panko. Lesson learned. The next stage is to heat the oil (olive or canola) in a saute pan over medium heat and to fry the crabcakes. This recipe made about 17 small-ish crabcakes, and we each ate about three of them for lunch. Thus, expect to have lots of leftovers or invite some dinner guests. I was familiar with aioli before preparing this recipe. My mom used to make pecan chicken with basil aioli when I was growing up, so I knew that by definition, aioli is prepared with raw egg yolks, just like a good caesar salad dressing. If you can get past that, it is delicious, totally safe and does not taste eggy at all (having said that, do not make this sauce if you have a health condition that makes it unsafe for you to eat raw eggs). Boil the three small potatoes (with the rest and separate) and skin them. combine the red wine vinegar, lemon juice, and garlic and simmer to reduce to 2 tablespoons. Note that this will not take long and you will have to do it twice if you get distracted by something else in the middle of the reduction, as it will stick to the pot and make a mess. Add the reduction to the potatoes and pistachios in the blender and puree. Add the egg yolks, olive oil, pistachio oil, mustard, 2 T water and puree/emulsify until smooth. The pistachio oil is very strong and thus you only need a small amount. It is, however, a bit on the expensive side. Mix in the heavy cream and tarragon and serve with the crabcakes. 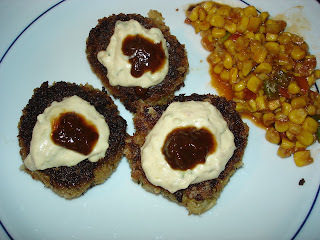 I also topped the crabcakes with a bit of plum chutney from the Bombay Emerald Chutney Company. I normally do not use store bought sauces and salad dressings, but this one is the exception to the rule. It always tastes amazing with crabcakes, no matter what recipe I use and what other condiments I make to accompany the crabcakes. During months other than the winter, we can buy this wonderful chutney (and other great produce and goodies) at the farmers market at Washington Park in Park Slope. Saute the corn, garlic and tomato until golden in the oil for about 4 minutes. Then add the lime juice, soy sauce, and chile powder and season accordingly. Once it is fully cooked, add the scallions. I like cilantro but was not feeling it with this dish, so I left it out entirely.